These Ultra HDMI high speed cables with Ethernet channel supporting resolutions of 4K x 2K AT 2160P. They support an audio return channel, 3D over HDMI and an HDMI Ethernet channel. 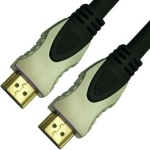 The cables are black with gold connectors and are backwards compatible to HDMI 1.4 and all earlier versions of HDMI.